Update: Version CRUTEM.4.6.0.0 has now been released. A description of changes in version CRUTEM.4.6.0.0 can be found here. CRUTEM4 is a gridded dataset of global historical near-surface air temperature anomalies over land. Data are available for each month from January 1850 to present, on a 5 degree grid. The dataset is a collaborative product of the Met Office Hadley Centre and the Climatic Research Unit at the University of East Anglia. Release notes for this version (CRUTEM.4.6.0.0) are available here. Previous versions of the CRUTEM4 dataset are available here. The gridded data are based on an archive of monthly mean temperatures provided by more than 5500 weather stations distributed around the world. Each station temperature is converted to an anomaly from the 1961-90 average temperature for that station, and each grid-box value is the mean of all the station anomalies within that grid box. 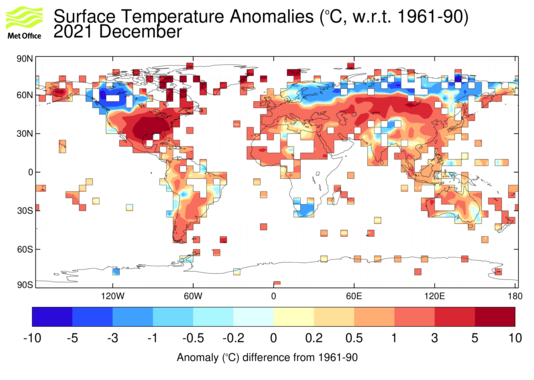 As well as the mean anomaly, estimates are made of the uncertainties arising from thermometer accuracy, homogenisation, sampling grid boxes with a finite number of measurements available, large-scale biases such as urbanisation and estimation of regional averages with non-complete global measurement coverage. Various diagnostics are produced from the monthly gridded fields. These include global and regional time-series. Dataset version information and previous versions. Summaries of CLIMAT message data used in monthly updates. Google Earth interface for CRUTEM4 land temperature data.